American University students asked the university to do more to address the problem of racism on campus during a protest Monday. WASHINGTON — American University students asked the university to do more to address the problem of racism on campus during a protest Monday. A few hundred people showed up to a protest on campus Monday afternoon in the wake of instances of reported black student harassment in the dorms earlier this month. On Sept. 8, a black woman said someone threw a banana at her while she was in her dorm room and another black woman said she found a rotten banana outside her door, along with obscene drawings on the whiteboard attached to her door. American University said the students responsible for the incidents have been disciplined. “American University’s negligence is what has allowed this to happen. There’s a reason students feel comfortable to assault black students on campus,” said Black Student Alliance President Ma’at Sargeant at the protest. 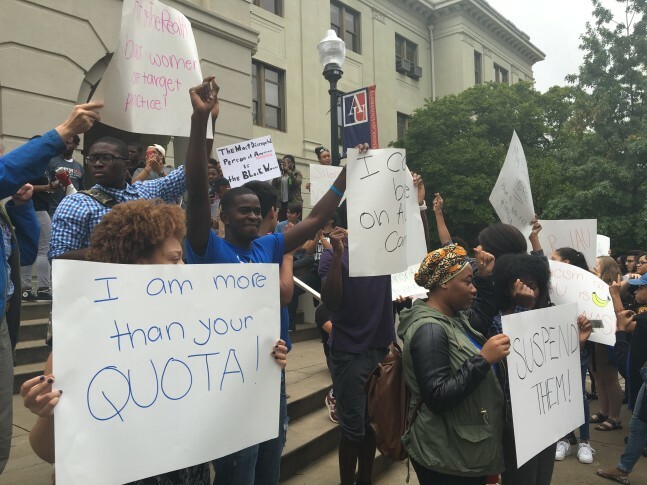 Protesters said the university has a history of racism and not dealing with it. “Nothing is ever done; no AU alerts, no consequences. Just town halls where we speak to deaf ears,” Sargeant said. The protest came the same day the university’s president called for campus events to address the problem and create a more inclusive climate. The incidents have left the black students “shaken, upset, and even feeling unsafe,” American University President Neil Kerwin said Monday. WTOP’s Max Smith contributed to this report.